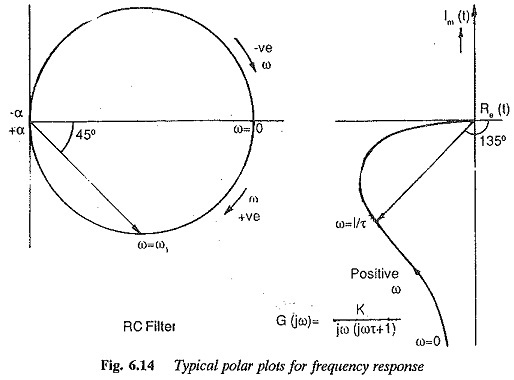 A typical Polar Plot for Frequency Response is shown in Fig. 6.14. It can be very easily seen that this kind of representation has a limitation. The investigation of the effects of changing parameters or adding poles or zeros to the existing transfer function requires recalculation of frequency response. The adjustment of parameters for the desired performance is rather tedious. The effects of individual poles or zeros are not separately indicated by the method. The logarithmic magnitude (gain) and phase angle are drawn as functions of frequency on a separate set of axes. The frequency is represented on a logarithmic scale as it is the most convenient one for this case. By this mag­nitude the plot becomes a plot of asymptotic lines, each of which has a slope —20 db/decade of frequencies. An immediate advantage that follows from these plots is that all the mul­tiplicative factors become additive ones. Therefore, by drawing the plots of individual factors and adding them we get the frequency response plot of the overall transfer function. 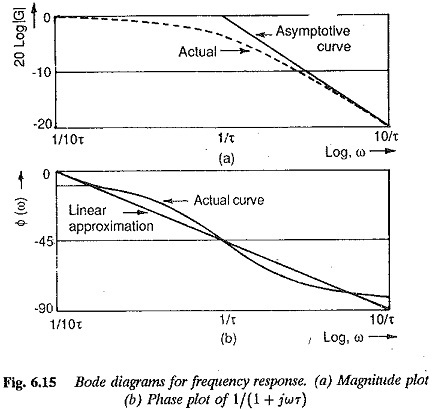 Figure 6.15 gives the summary of the Bode Plot for Frequency Response of the important basic functions. We discussed and concluded in the previous section that a higher order sys­tem having a dominant pair of complex conjugate poles can be represented by an equivalent second order system. These relations are useful for determining the damping ratio for experimental frequency response. 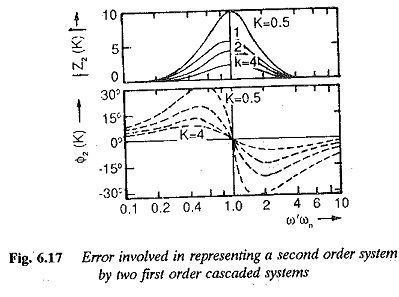 The magnitude and phase Z2 as function of K are shown in Fig. 6.17. From the figure it is clear that the error in magnitude as well as phase plots increases as the value of t decreases. For larger values of t the deviation of the asymptotic approximation from the actual response becomes negligible and Z2(K) = 1. Thus the ratio of Tm/TA decides whether the approximation would be valid or not. 3.The proper corrections are made to these asymptotic curves to arrive at the exaet curve. 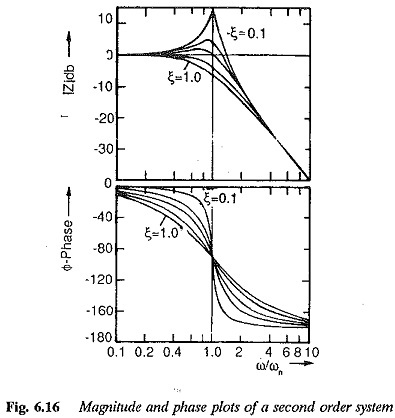 4.The phase angle plot is obtained by adding the individual phase angle curves of the factors. The advantages of this method are obvious. It takes much less time to draw these curves compared to the other methods used for determining the frequency response. The curves of a given transfer function can be easily modified to take into account addition of poles and zeros for improving the performance. Once one becomes used to these plots, the composite asyrimtotic plot can be directly drawn doing the summing process mentally.